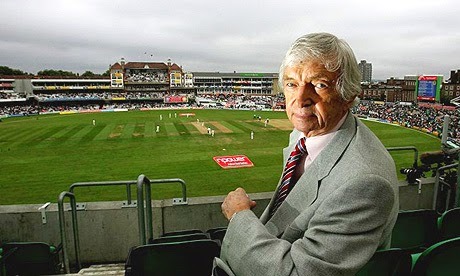 Just Add Water: Richie Benaud Dies, RIP Richie. What the heck has this got to do with wargaming I hear you say? Well in my case a lot. I started watching Test Cricket when I was six years old, watching the likes of Michael Holding rip into the England line up with his constant 90mph plus bombardment of the batsmen. his natural length always seemed to threaten the both the batsmen's wicket and indeed their personal well being! Cricket over the years has helped form a real sense of fair play in my gaming. It has taught me that losing is no bad thing and I have learned to enjoy the experience of losing ('tis a good job too!). No one, possibly in world media, could have communicated this lesson more so than the Late Richie Benaud, who over the years provided a less is more type of commentary to Test cricket. He was the common man's commentator, famously refusing to take up the mantle of Sky commentator as he strongly believed that a country's national sport should be free and not help in the avaricious corporations only interested in making money and not the promotion of a national past time. Indeed, this is a particular view that I share. Test cricket has slumped in recent years, since the ashes triumph for England in 2005 and I put this down largely to the fact that it is no longer on TV. Richie championed this ideal and was probably one of the key factors leading to Test Cricket remaining free in his homeland of Australia. His commentary, often tinged with ironic humour was a real joy to listen to, Richie only adding to what we saw on our screens with his typical less is more touch, his silence building up tension allowing one to formulate one's owns thoughts before he interjected with his own- always more insightful than that of the viewer. Famously he once said, whilst admiring Ian Botham's brilliant stand against Australia that turned the Ashes series in 1985, "I've been messing around with this for a while now and I've never seen anything like it!". This could apply in equal measure to my antics on the wargames table! So, us Cricket fans bid a fond farewell to one of the true giants of the game, a great player and perhaps an even better commentator. But I'd still prefer to watch free-to-view Indian Premier League cricket than any Test Match. Watching the IPL stirs up my interest in 'The British in India', gets me reading and thinking about stuff with our hobby. In a similar way, thats my own link between the game of cricket and the hobby of playing / painting toy soldiers. In the words of the great Clive Lloyd, "Text cricket is an examination, 20/20 cricket is an exhibition"- I couldn't agree more with him if I'm to be honest. 20/20 just doesn't cut it for me.